Below are the television networks and web listings that air the Christ in Bible Prophecy show hosted by Dave Reagan/Lion and Lamb Ministry. 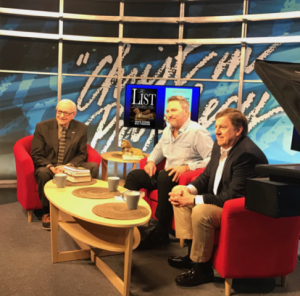 The interview with Bill Perkins and Buck Storm regarding the new novel THE LIST will air the week of April 14. Wed. 6:00pm CT, DirecTV 369, DISH 263, broadcast stations, satellites, and web streaming (daystar.com). Tues. 12:30pm CT, DirecTV 373, satellites and web streaming (thewordnetwork.org). Sat. 7:00pm CT, DirecTV 367, web streaming (lesea.com/wht). Thurs. 8:30am CT, DirecTV 365, web streaming (www.god.tv). Sat. 5:00pm CT, DirecTV 363, web streaming (gebamerica.com). Wed. 12:30pm CT, DirecTV 376, DISH 267, and web streaming (ctnonline.com). Sun. 4:00pm CT, DirecTV 378, web streaming (nrbnetwork.tv). Sun. 7:30pm CT, DirecTV 377, ten broadcast stations in the Midwest and web streaming (tct.tv). Mon. & Fri. 9:30am, CT DirecTV 379 (www.upliftv. com). Mon. 7:30am CT, DISH 218 (www.myfolk.tv). VTN (The Victory Television Network) — Covering the state of Arkansas. Sun. 10pm CT, Tues. 9:30am, Sat. 5:00am and 2:30pm (vtntv.com). KXTU — Colorado Springs, Sun. 9:00am CT, channel 21, (www.fox21news.com/soco-cw). WTOG — Tampa and St. Petersburg, Sun. 8:30am ET, channel 44, (cwtampa.cbslocal.com). Georgia WATC — Atlanta, Sun. 8:30am ET, channel 57, (http://watc.tv). Kentucky WBNA — Louisville, Sun. 8:30am ET, channel 21, (wbna21. com). FVN — Southern Louisiana broadcast stations and cable, Sun. 12:30am CT, Sun. 6:30am, Mon. 8:30am, Wed.
7:00pm, and Sat. 10:30pm (familyvisiontv.com). KMCT — Monroe, Fri. 10:30am CT, channel 39 (http://kmct.tv). KMCI — Kansas City, Sun. 7:30am CT, channel 38 (kshb.com/38-the-spot). WCCB — Charlotte, Sun. 7:00am ET, channel 18 (ccbcharlotte.com). WRAZ — Raleigh-Durham, Sun. 7am ET, channel 50 (fox50.com). WUAB — Cleveland, Sun. 7:30am ET, channel 43 (cw43.revrocket.us). WPCW — Pittsburgh, Sun. 7:30am ET, channel 19 (https://cwpittsburgh.cbslocal.com). Tennessee WNAB — Nashville, Sun. 7:00am CT, channel 58 (http://cw58.tv). WBXX — Knoxville, Sun. 8:00am ET, channel 20 (wvlt.tv/cw/home). Texas CFNT — Wichita Falls, Fri. 3:00pm CT (cfnt.org). KCEN — Waco & Temple, Sun. 6:30am CT, channel 9 (kcentv.com). KDAF — Dallas-Ft. Worth, Sun. 8:00am CT, channel 33 (cw33.com). KSCE — El Paso, Sun. 10:30am MT, channel 38 (https://lifechristian.tv). KUBE — Houston, Sun. 8am CT, channel 57, Comcast cable 53, DirecTV & DISH local 57 (http://kube57. com).